← Losing Motivation? Trying to fight the Winter Blahs! Last April I was at a loss for words…I had just completed my 4th Warrior Dash with my childhood bestie and was shocked at the debacle unfolding in front of my very eyes. I am not going to rehash how unbelievable the situation really was, but I am sure that the race directors were well aware of how terribly run, ill-prepared and shocking the Warrior Dash was here in Georgia in 2013. Needless to say, I was hesitant to return this year, but writing this today…I am so very glad I did! The team at Red Frog Events decided to return the event to Mountain City, GA. This small town embraces the event and the runners every year. They are kind, they volunteer, they cheer from their cabins, campsites and RV’s & they make the event better! Jennifer and I make this a girls weekend every year, and we look forward to it all year long…from our matching t-shirts and socks, our lounging at the Holiday Inn Express, lots of wine and snacks & no families to take care of…its is wonderful! All of that said…Georgia Warrior Dash 2014 was well prepared, safe and challenging & a great event! Throughout our wave people were laughing, smiling, helping each other, pushing each other to try harder and having a great time. As we crossed the finish line, we gathered our medal (which also doubles as a bottle opener!) and we headed back to the village for the after party! Red Frog Events welcomed Shock Top Brewery this year & the crowd LOVED IT! We sat in our mud soaked clothes and enjoyed a cold beer (or two) in the sunshine while people watching for hours! There was live music, a DJ, a pushup contest, tug-of-war and a dance party! One major shout out to the volunteers and staff that kept the Village clean! I never saw a trash can over flowing with garbage, very little trash around on the ground, there were plenty of bathrooms & parking was a breeze! For the rest of our weekend, Jennifer and I kept coming back to the same comment – This year was AWESOME! I will chalk up last years event (2013) as a learning experience for Red Frog Events and the Warrior Dash team. They took that experience and made 2014 a fun and challenging weekend for everyone! Jennifer & I look forward to next year – Year #6 for our Moms Warrior Dash Weekend! For more information on Warrior Dash or other mud run/obstacle course events, feel free to send me an email. * Share your event stories in the comment section below, on Twitter or on Facebook. This entry was posted in Exercise, Fitness, Health, Health & Wellness, Mom, Uncategorized, women and tagged exercise, fitness, health, men, moms, mud runs, obstacle courses, Red Frog Events, Running, sports, warrior dash, women. Bookmark the permalink. 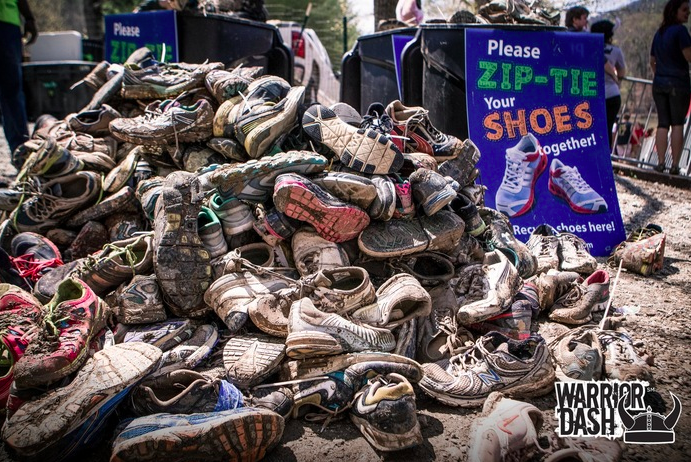 1 Response to Warrior Dash 2014 – The Year of Redemption!